It’s been a busy couple of weekends here on the block. With Deirdre’s parents coming next week to help put up the frame we’ve been busying ourselves with shovels and concrete to get the footings and floor for the yoga studio complete. The design process for the yoga studio was quicker than that of the bus. After toying with a few different sizes for the studio we settled on a 2.4m by 4.8m studio. Those dimensions being settled on by the simple fact that the wood for the bearers and joists came in that size. We figured it would be easy to not have to cut the wood down to size too much. Continuing on with the ease of construction we chose a single sloping roof. Going from a height of 2.7m on the east to 2.4m on the west. The whole studio would be cladded in a combination of corrugated tin and wood. On the east and west there would be a window. On the north a double french style type doors. The dimensions and descriptions of which are on the photos below. Having learnt our lesson from the decking we erred on the side of more posts and bearers then required. This way we could be certain that the studio would be as strong as possible. In the end this meant a design of 3 rows of 5 posts spaced at roughly 1200 intervals. Attached to each of these posts would be two bearers- on on either side. The joists would then be set atop of these. All of these can be seen better in the picture below, including the description of the wood we used. Over the courses of the two weekends we set about digging holes for the posts. Conscious of the structure needing to be square this took longer then we thought to complete. We marked out the first and last post on one row and then set those with prepared concrete mix. With the two posts in and set at either end we then marked out the three other holes and dug those out to roughly 550m. End posts in, getting ready to measure and cut the next posts. Next we then had to measure out the height of the posts. With the earth at various heights and the holes at various depths we had measure each post to the string line and then cut the posts to fit. With the posts cut we would then set the three middle posts one by one. To ensure that we had the posts aligned we used both a string line and one of the bearers. The bearer being a point of reference to ensure that the posts aligned correctly. We then repeated this one the other side and then worked out the middle row, using the two outer rows to ensure that these posts were all in the centre of the structure. All posts set and first of the bearers on. Setting the bearers and joists. The posts set and in place next we attached the bearers. A fairly easy task, although we did discover that with some of the warp in the wood we were 10mm narrower in the middle of the structure then on the edge. With the bearers on Deirdre then set the joists. We had made the decision to use form plywood for the flooring. These were 1200 wide which meant that we needed to have joists there to attach the floor to. Deirdre marked these out and then placed the joists one by one, ensuring not only that they were at the right length but that insulation would fit without any need to cut it. Deirdre checking for level on the joists. The joists completed and attached we spent one morning this week adding the insulation and then the floor. Again a task that was completed fairly quickly and we now have a floor ready for the frame to put up this week. Yoga studio flooring on ready for the frame! This week marks 9 months since we’ve been living on our block. It’s not a significant birthday but it does seem to signify a change in direction on our life here. Gone is the focus on the bus (there are still a few minor jobs and the issue of mould to do before next winter.) Instead we are now shifting our attention outside to the garden, to the yoga studio: to the creation of other spaces. The first of which has been to create some garden beds. Originally our idea had been to create raised wicking beds but as we collected a pile of logs our cleared trees our thinking shifted. Instead of raised beds we thought we’d attempt a hugelkultur bed. It would provide the water retention over time and would clear up some of the timber we hadn’t been able to mulch. Step 1: Dig out your hole. As the article link to above illustrates the rules for creating hugelkultur beds are general in principle. The main elements being to bury some wood, cover this with leaves and manure, add top soil and mulch. Reading through a variety of articles it was difficult to determine how deep to dig the hole. Working backwards from the height above ground we settled on digging out our bed to the depth of 30cm. This meant that over a course of a few days Deirdre and myself took to digging up our clayey soil creating a bed roughly 7 metres long and a 1.2 wide. For ease of access we added a few keyhole paths coming off one of the sides. In our case this meant a pile of 50-150mm diameter lengths of mainly silver wattle. We had some stringy bark as well but due to it’s allopathic quality we put them aside instead choosing to use the silver wattle. As the woods varied in lengths this meant some chainsawing before. To speed up our chainsawing I rigged up a wooden log holder from some off cuts. Once the wood was cut to lengths of between 600 and 900mm we then carried them up to the bed and added them in. We started with the bigger bits on the bottom adding the smaller pieces on top of this. With the wood in place (roughly up to the height of the hole) we then watered the logs to help promote breaking down. After watering the wood we then set about filling in the gaps with some twigs, mulch, leaf matter as suggested from the article. This was the hardest part of the construct as we had scrounge around trying to find some leaf matter. We ended up settling on some green leaves from some prunings and a pile of bracken and broken down leaves from our wood piles. Once the gaps had been filled we added in some manure. This was sourced from roadside stalls around the valley. We added it to about a 5 cm depth over the top of it all. 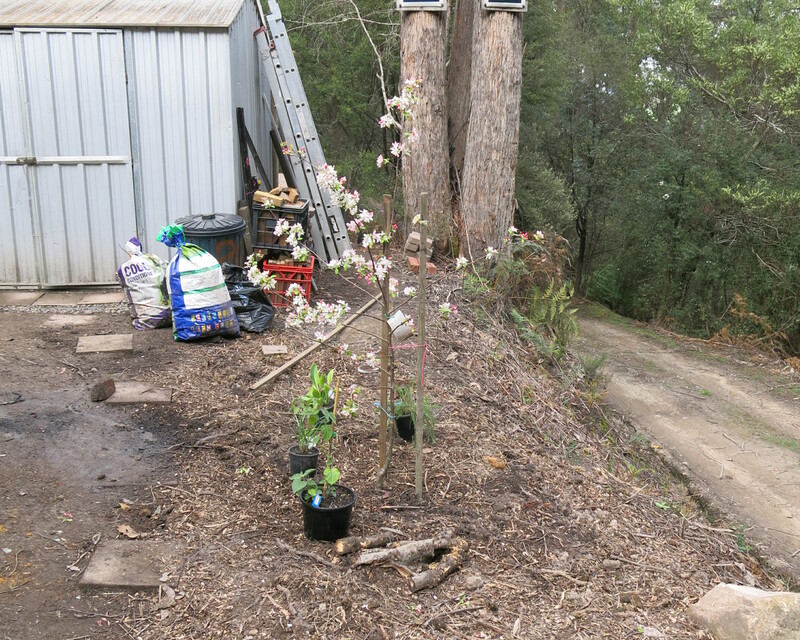 To this we then added a few bags of biochar that we had created. Our rational being the biochar will help with the water retention. Step 6: Add back some of the top soil. 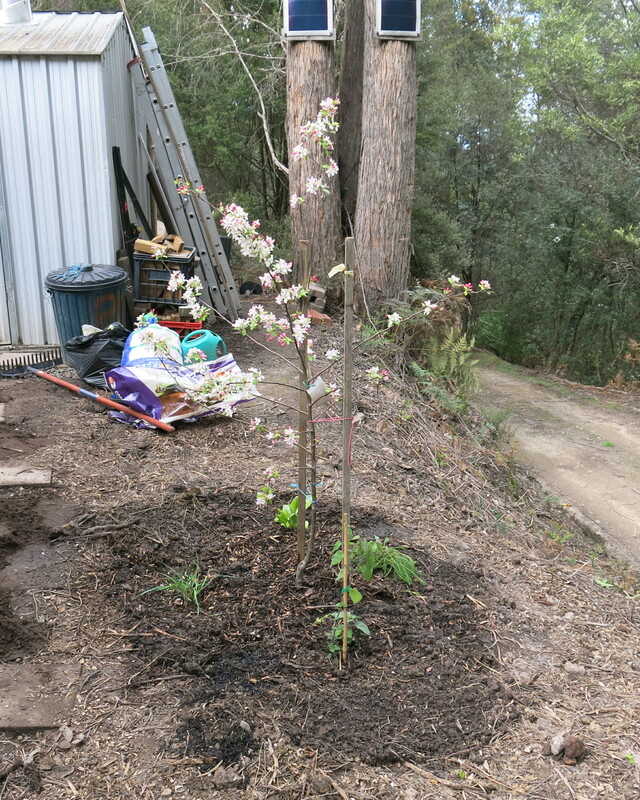 The next step was to add back some of the soil that we had dug out. The reading we had done talked about adding the topsoil with the roots back. A little difficult given we were starting from a place of no growth. Instead I chose to add the more looser soil from around old tree roots to the top of the bed. Hopefully it doesn’t add to much clay to the bed, only time will tell I guess. As mentioned our soil is mainly clay and therefore a little tricky to grow into straight away. Since we wanted to plant in our bed ASAP we order in some extra manure and soil. This was then added to the depth of about 10cm above the previous soil. With the soil added it was then time to add some mulch. Normally we would have settled on some straw from the local nursery but with the dry 2015 winter and spring and 15-16 summer the availability of straw is limited and so we settled on pea straw from the hardware. The next step will be to plant it out with some seedlings and see how they go. This would have happened this week but our little greenhouse blew down in the winds this week and so we will have to start all over again. All up the bed took us probably two-three hard days of work. Most of that being digging and chopping the wood. Once that had happened the rest of the steps probably took no more than a day. Hopefully the work has been worth it. I’ll add a part 2 on after summer to report on how the bed has gone. This post then is a little bit of a catch up of some of the things we’ve been busy doing. Firstly there’s a step by step on the Pallet Island we created out the front of the deck. Then a couple of photos of our apple guild and finally a photo of the dog run that Deirdre completed and worked on. As written before we had purchased some pallets to construct a deck. the pallets didn’t work for the deck and so we had 4 painted pallets waiting to be reused. After a few days of the pallets sitting there we decided to construct a pallet deck. Set out the front of the decking it would be our island floating in a sea of grass. To construct the Island we set about repeating the process for the deck. That is set out some footings, some bearers and then sit the pallets on top. As you can see from the series of photos below. We forwent digging the posts and just set them on the ground. Our rationale being that because the deck was only a few hundred mm’s off the ground that we didn’t need to dig the posts in so deep. Setting the first of the bearers and posts. Setting the middle posts one footing at a time. Also with the ground sloping in multiple directions it would be too difficult to work out the various heights needed. Of course though we still needed level posts and so using some gravel we levelled the ground and cut each length of post to the right height and then using a set of clamps we bolted the bearers to the posts creating a level area for the pallets. Half down. Deirdre busy marking out the footings for the last two pallets. We set up two pallets to test that we had it right and then set about doing the other half. Deirdre relaxing at the end of the day. Oscar and Yoda relaxing on their new day bed. To add some extra colour to the garden we purchased a crab apple tree as an ornamental feature for our front section. A Japanese Crab Apple with pink and white flowers. Under this we have planted out some yarrow, comfrey, chives, chamomile and white, black and red currants. Whilst I’ve been at work Deirdre has been busy building a dog run. 9 months in and finally Oscar and Yoda get their own space (and we get our own as well.) The frame of the run is made from some timber we had on site with some chook wire around it. 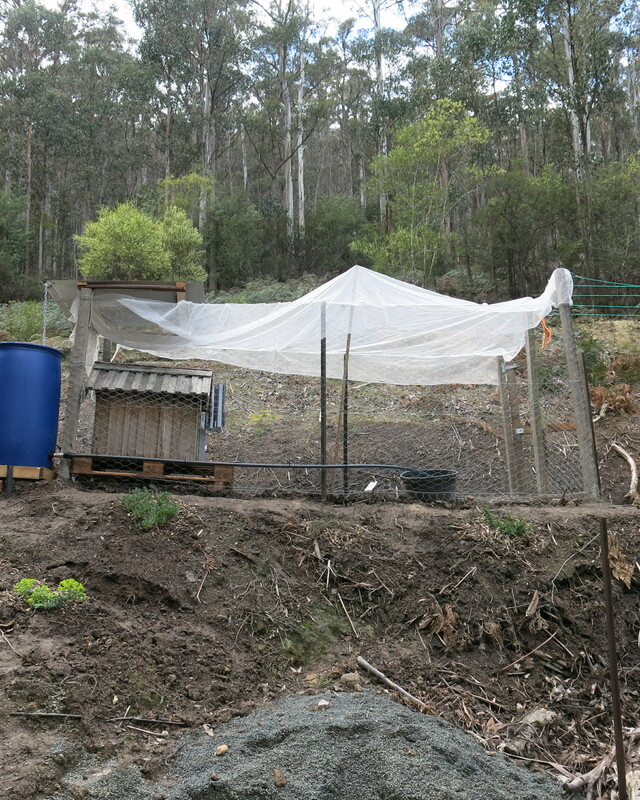 The blue bin is a old washing liquid drum picked up from a spot in Cygnet. It acts as a water catchment for the two boys catching the water off the roof. The white net is an old veggie netting adding after Oscar cleared the fence one day whilst waiting for his dinner. We’ve had snow and rain gushing down the driveway. We’ve seen our reserve road become bumpy as the water has pooled on it. We’ve gotten blister and cuts. We’ve started fermenting veggies and other things and have bottles line all over our shelves. We’ve become appreciative of the local market. We’ve started some paths and groundworks and are beginning to design our back garden ready for summer. We’ve been thankful for our solar panels and surprised at how little power we’ve used (the lowest charge we’ve had after 2 days of no sun was 94%). But enough of the listing. It’s best to view this through a series of photos so the rest of this post is dedicated to the visual. Deirdre, Oscar and Yoda enjoying some relaxation at the end of the day. The bus with it’s floorboards exposed, should make installing the floating floorboards easier. The floor in the back complete. At this stage we have finished 3/4 of the floor with some final parts to go. The area behind the bus to be cleared and turned into a kitchen garden. The ground is steeper and rocky then thought so will have to do some earth moving. Currently we are working on adding some decking to the bus. This has been a slow ongoing over the last month due to the weather and both of us working full-time. It’s lightly snowing today so any chance of some more work today is not likely to happen. The picture below show the footings being put in and some paper sketches that Thanasi, Deirdre’s sister Tara’s partner, drew for us. We were aiming to get it down by the end of the month so hopefully we can keep to that deadline. Although in reality it’ll be another 3 weeks. There’ll be a more detailed post on this when finished. We are currently sketching and designing a yoga studio/ sewing room/ office space to be built in late spring. The plan is to build on one of the terraces behind the bus. It’ll be 2 metres by 4.8 metres in order to meet local legislation which says that you can build a non-habitable building less than 10 sq metres without planning approval. With the days getting longer we’ve found ourselves dreaming more of what our back of the bus garden will look like. We tossing up the idea of having raised garden beds, wicking beds, hugelkulture beds or a combination of all three. It’s a matter of cost and the matter of what materials we can source. We hoping that come the start of spring will have a design and be ready to plant out. So that’s about it a quick overview of the six months here. I’m tossing up the idea of writing a more dedicated post on what we’ve learnt over time. Sort of in line of the earlier design posts we did from Mount Barnett. I’ll see how that idea goes. Enjoy the reading and the visual overview.